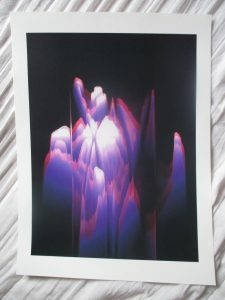 These prints are in stock and available for immediate dispatch. 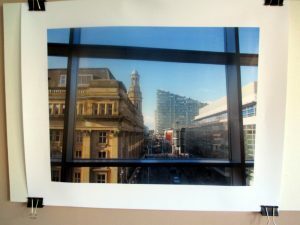 #Manchester [Scapes] – a view of Market Street in Manchester as seen from the Arndale Food Court and framed by the windows to create a “hashtag” effect. 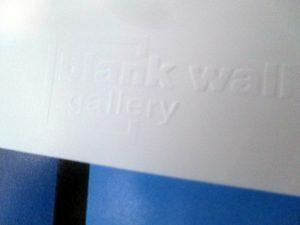 Professional gallery quality 50cm x 40cm print (including border, image size 39.5cm x 28.5cm) produced by the Blank Wall Gallery (Athens) and displayed in their “Cityscape” exhibition March 2018; embossed with their logo top right. £34.95 with free shipping in UK (other locations quoted on request). 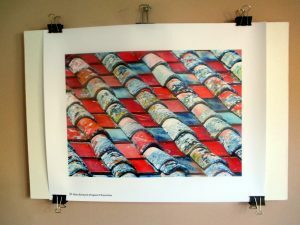 Piastrellato [Abstract] – detail of a tiled roof in Anghiari, Italy. This image won Best In Show in the Contemporary Art Gallery Online (CAGO) “All Colors” photography/digital art category November 2017; and was a finalist in the Fusion.Art international juried competition “Colorful Abstractions” November 2017. 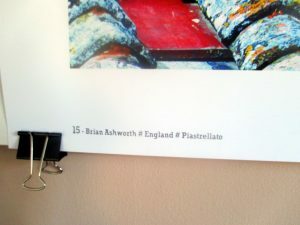 Professional gallery quality 50cm x 40cm print (including border, image size 39.5cm x 28.5cm) produced by the Blank Wall Gallery (Athens) and displayed in their “Moments of Color” exhibition March 2018. Ice Forest [Glitches] – an unedited photograph, not digital painting or manipulation, of a stand of trees as recorded by the malfunctioning sensor on my Ixus 90is. This image won Second Place in the Contemporary Art Gallery Online (CAGO) international juried competition “2017 Photography Digital Art” in December 2017. Open edition 2017/03, 40x30cm professional print on on Hahnemuhle photo rag 308gsm 100% cotton paper using Epson Ultra Chrome K3 inks (lightfast for 100 years), mounted on 50.5×40.5cm (20×16 inch) Daler Rowney mount with backing board. £27.50 with free shipping in UK (other locations quoted on request). 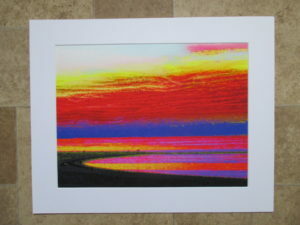 Atomic Sunset I [Abstract] – digital manipulation based on a section of my photo of a sunset over the city of Manama, Bahrain. Open edition 2017/03, 40x30cm professional print on Hahnemuhle photo rag 308gsm 100% cotton paper using Epson Ultra Chrome K3 inks (lightfast for 100 years), mounted on 50.5×40.5cm (20×16 inch) Daler Rowney mount with backing board. Dusty [Motorsport] – in October 2011 F1 made its debut in India, at the newly constructed Buddh International Circuit. Situated in open farmland 25 miles outside the capital city of Delhi, dust was a major challenge for all involved, as someone noted on the nose of the Renault R31 of Bruno Senna. For me this image, taken on the first day of the event, neatly summarised the experience. 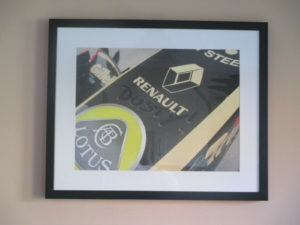 This actual framed photo was exhibited at the Swift Motorsport Gallery in Stoke from May to October 2017, as one of the winners of the photographic competition of 2016. Open edition 2017/05, professionally printed on Hahnemuhle photo rag 308gsm 100% cotton paper using Epson Ultra Chrome K3 inks (lightfast for 100 years), mounted in a 53x43cm (21×17 inch) black frame, visible print size 39x29cm. £39.95 with free shipping in UK (other locations quoted on request). Not For Highway Use [Motorsport] – at the concluding race of the 2009 F1 season, the inaugural Abu Dhabi GP, a wet weather tyre unlikely to see action at this circuit. A different perspective of an essential component of motor racing, I also wanted to capture the stern warning that it most definitely is “not for highway use”! 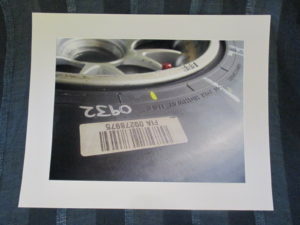 This tyre was mounted on a Toyota TF109 wheel ready for their final race in F1, both cars finishing in the points. This actual photo was exhibited at the Swift Motorsport Gallery in Stoke from May to October 2017, as one of the winners of the photographic competition of 2016. 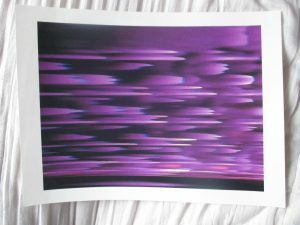 Open edition 2017/04, professionally printed on 40.5×30.5cm Kodak matt paper with light-fast inks, on a 50x40cm mount (no backing board). £24.95 with free shipping in UK (other locations quoted on request). 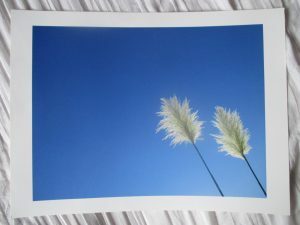 Together [Minimalism] – a pair of stalks of pampas grass under a glorious blue sky. This image was shortlisted in the Motif Collective international juried competition “Minimalism” in November 2016. 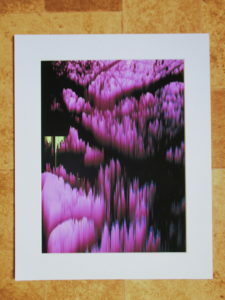 Open edition 2019/nn, professionally printed on 40x30cm (with border; image size 34×25.5) natural white, matte, ultra smooth 100% cotton rag acid and lignin free paper using Epson UltraChrome K3 archive inks, unmounted. £19.95 with free shipping in UK (other locations quoted on request). 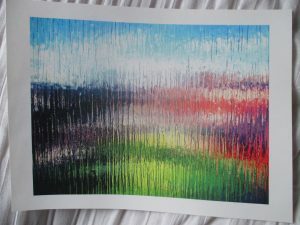 Spectrum (Kaleidoscope) [Abstracts] – view through a reeded window across a back garden. This image was awarded Special Recognition in the Light Space & Time “Abstracts” competition March 2017 and shortlisted in the Motif Collective “Colors” competition September 2016. Keys [Glitches] – my laptop keyboard as seen by the misbehaving sensor on my digital Ixus. Starlight I [Glitches] – star shaped lamp as seen by the misbehaving sensor on my digital Ixus.